One of the best ways to prepare fuzzy melon is to cook it in this simple Fuzzy Melon and Glass Vermicelli Stir-fry. It is perfect eaten with a bowl of rice. 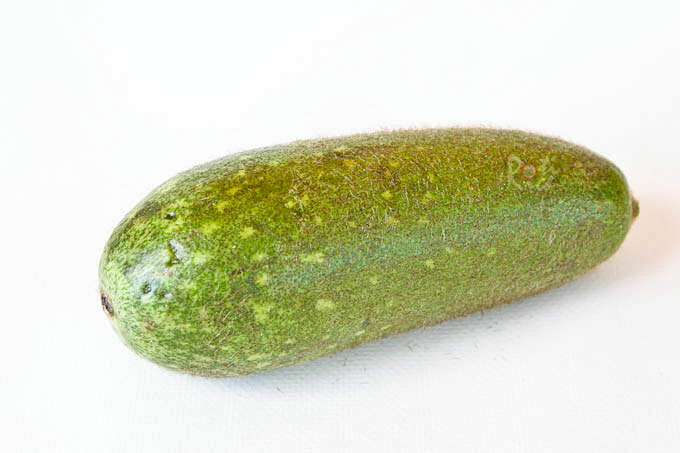 Fuzzy melon or hairy gourd 节瓜 (jié guā) or 毛瓜(máo guā) resembles a large hairy zucchini. It is related to the winter melon and has a deep green skin that is slightly spotted with tiny hairs on it, hence its name. 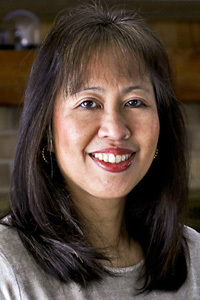 The skin is normally peeled and the flesh julienned or cubed. It is then stir-fried, cooked in a soup, or stuffed and steamed. 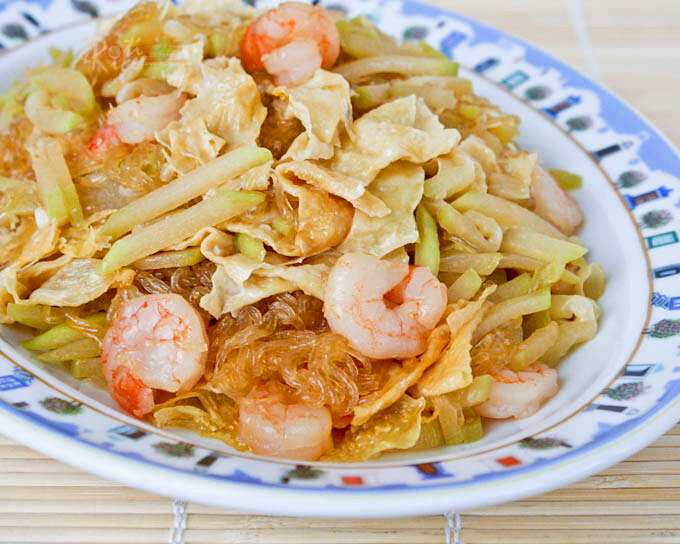 Traditionally, the fuzzy melon is cooked with dried shrimp, minced pork, and glass vermicelli. Mom cooks it with dried shrimps, glass vermicelli, and blistered (or fried in oil) beancurd sheets. I substituted the dried shrimps with fresh shrimps for the sake of my boys. They both love the dish especially Ro-Jiro. 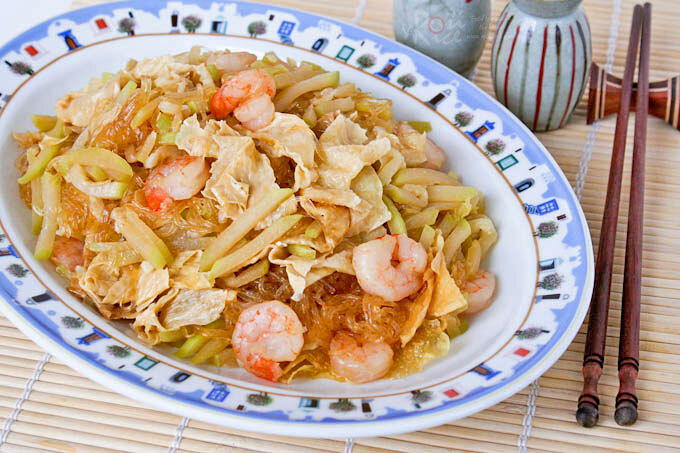 Prior to finding the fuzzy melon, I have been cooking a similar dish with shredded cabbage, carrots, tofu puffs, and glass vermicelli. That is also a favorite of theirs. Soak glass vermicelli in a bowl of water for 15 minutes to soften. Drain. Peel fuzzy melon with a vegetable peeler. Cut into thin slices of about 1/8th inch thickness and then into strips. Heat 3 tablespoons of vegetable oil in a wok. Add dried beancurd sheet one at a time to brown and blister. Remove and break into smaller pieces. In the same wok, add remaining 2 tablespoons of vegetable oil. Fry garlic until fragrant. Add shrimps and cook till they curl and turn pink. Add fuzzy melon, glass vermicelli, water*, soy sauce, and salt to taste. Give it a good stir. Finally add fried beancurd sheets. Allow it to soften** before stirring to get everything well mixed. * The water is needed to cook the glass vermicelli. The water will eventually be all soaked up by the vermicelli. **Blistered beancurd sheets should be allowed to soften with the steam before stirring to prevent them from breaking into tiny pieces. This sounds healthy and tasty! I don’t think I’ve had fuzzy melon before, although I make something similar using chokoes instead, with glass noodles and eggs. Is the beancurd sheet you use the kind for wrapping loh bak? The beancurd sheet I used in this recipe is different from the on used for lobak. These are dried beancurd sheets normally used in soups and stir-fry. If you have the patience, you can use a damp cloth to wipe these dried sheets to moistened them for wrapping lobak. This is taste of home to me! The name 大姨媽嫁女 is so funny! What a funny name! I tried to think if we have some dishes that has a funny name that I can share with you…but at the moment I can’t remember or think of any. I love vermicelli and I bet it goes so well with shrimp and fuzzy melon. I love your picture! I like dong fun ! How I wish I can taste your plate of this glass vermicelli ! Hey Biren, Happy CNY! Guess what! This is one of my fave dishes & I really love this. What a nice treat! Sorry for the long absence as I’ve been really busy over CNY. Lol! OMG – I haven’t had breakfast yet and that looks amazing!!! I always wondered how to use fuzzy melon. Your stir fry looks amazing! This is a very Cantonese dish with a most interesting name. 🙂 I love it too! What an interesting and fun name! It looks tasty too. 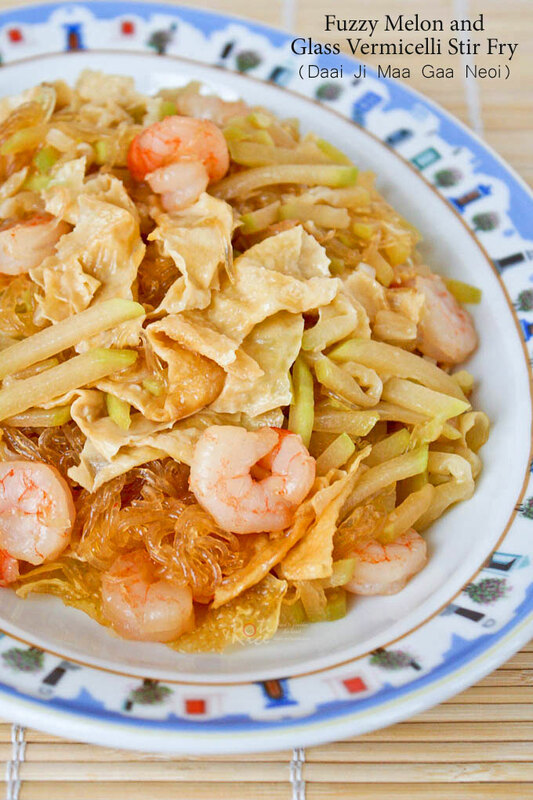 This looks really appetizing… I love bean curd sheets, and shrimp and glass noodles… Never tried fuzzy melon before, but it sounds fun! 😀 Great post, Biren! This is a very interesting dish! Have added to my to try! This looks delicious, you’ve added so much prawns! Biren – This vermicelli dish is making me really hungry. It looks and sounds so delicious. I don’t think I’ve ever seen fuzzy melon, but I will look out for one next time I go to an Asian market. Hi Biren! I am sure this will be a great treat for the whole family…I love vermicelli! Thanks for sharing this recipe. Yummmy! Happy ‘Yuen Xiao Jie’ to you & your family. Hope you’re having a wonderful day, Biren. Yes naming the dish is most difficult…lucky you have such help. There is one dish I made that I grew up with the name of the dish Rum-tum-tidy, not sure of what it means, but I think it has an English background…funny name. I have some Korean sweet potato noodles too (they came in such a large amount). I will try your beautiful dish. you always use the most amazing and interesting ingredients. I love this stir-fry. It looks so flavorful and delicious! I don’t know if I’ve ever had a dish with crispy bean curd. I bet the texture it adds is fantastic. Does it represent the “elderly aunt”? 🙂 Love all of the other ingredients – very unusual. Looks like another fabulous dish! I think the name came about because eldest aunt was such a cheapskate that when she married off her daughter, this was what she served the guests. I have used courgettes and English gourd as a substitute for hairy melon and we actually like that more. Thanks Slau for visiting and sharing your thoughts about how the name of this dish came to be. 🙂 I agree with you that courgettes or zucchini (as it is known here) is an excellent substitute for the hairy melon.